Many students struggle with reported speech. They feel that there are many rules they have to follow and they often get confused. In this post I try to simplify the rules about the reported speech (or indirect speech) as much as possible. There is mind map describing the basic rules, a video and two games to practise the grammar. To put it simply, reported speech is used when you start a sentence with an expression like She said or He told me etc. Then you have to move the verbs backwards. Thus you change the present simple tense into past simple. You change the past continuous to past perfect continuous and so on (see the mind map for more details). Watch the video and try to understand the explanation of the rules. In this mind map I try to explain the basic rules. First of all, reported speech happens after the reporting verbs (said, told, claimed etc.) in past tense. Then you have to move the original verb from the direct speech. The changes are depicted below. The most common changes are depicted in the lower part of the mind map. If there are the verbs ARE, IS, WILL, CAN, HAVE or DO in the direct speech, just change them as shown and you do not have to do anything else. 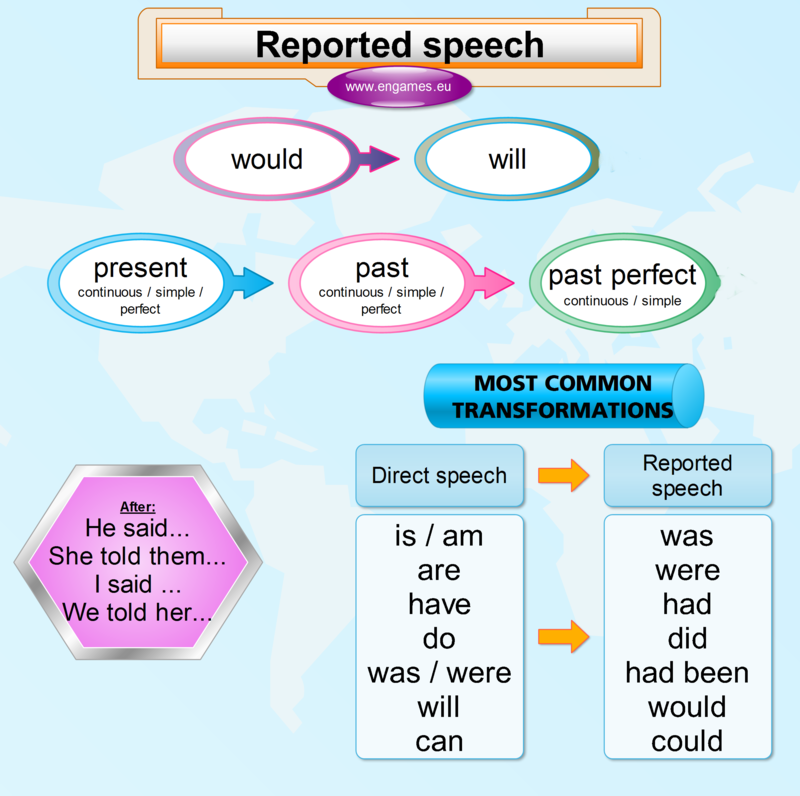 The most common changes in reported speech. The first game is called Hoop shoot. You will see a reported sentence and your task is to choose the correct sentence in direct speech. If you succeed you will be given the chance to score a basket. Download the following pdf file and open it with Acrobat Reader, otherwise the game will not work. The second game is a quiz. 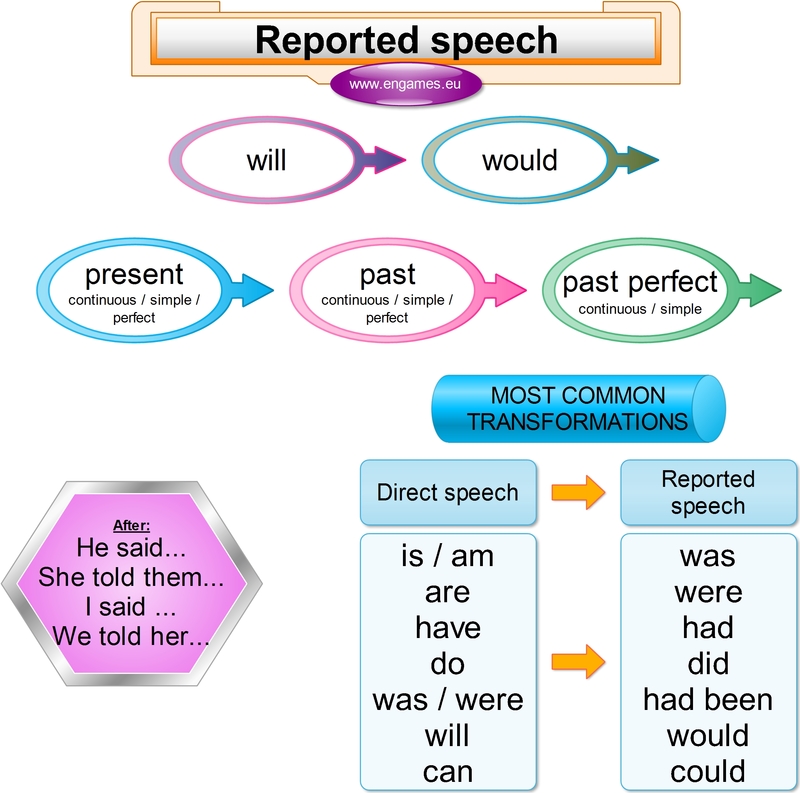 You will see the direct speech and your task is to complete the reported speech sentence correctly. If you pass the quiz you can play the game Indiara. All of these are in HTML5 so they should play on your mobiles without the slightest problem. Great mind maps. They’re very useful. However, I noticed that the first row of ‘bubbles’ shows the changing of the verb from ‘would’ to ‘will’ (reported to direct speech) whereas the ‘bubbles’ beneath it show the changing of tenses when the sentences are ‘moved’ from direct to reported speech. Is this a mistake or did I misunderstand the map? Thanks for spotting the mistake. I will correct the mistake.